Dambuster Deicer Roof Deicing Products - Roof Ice Dam - The Best Solution for Roof Ice. The best way to keep ice dams from causing roof damage is by not allowing the freezing process to begin. The unique, patented design of the Dambuster Deicer works magic to prevent refreezing. 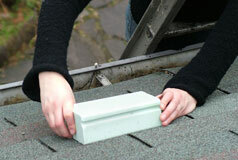 They are best applied to your roof just prior to freezing inclement weather. Simply place Dambuster Deicer products near or just above the drain on the roof. After a snow and during a melt, the Dambuster Deicer will slowly dissolve from the bottom, releasing small amounts of mild de-icing brine. This lowers the freezing point of melting water as it runs off the roof, keeping ice from accumulating around the roof edges, drain box or downspout. Plus the brine's low salt concentration reduces salt-related damage to drainage systems. Dambuster Deicers have been designed for all flat or low to medium-sloped roofs. They will not corrode or damage your roof or roofing materials. Dambuster Deicers will dissolve or become small enough for easy removal by spring. A second application may be needed when there is repeated, excessive precipitation. Learn more about our deicer product line. Dambuster Deicer roof deicing products come in several varieties, each developed for specific roof types and situations. Learn more—click here. Have questions regarding Dambuster Deicer products? Read our answers to common questions about roof maintenance, roof de-icing and Dambuster Deicer products. Place bricks as shown in illustration, 3-4 rows above gutter. If bricks slide when released, the roof is too steep for proper installation. Bricks cannot be installed onto roofs with a pitch steeper/greater than 10/12 pitch. Install 4-8 ft. apart and approximately 2 ft. from the bottom of valleys. 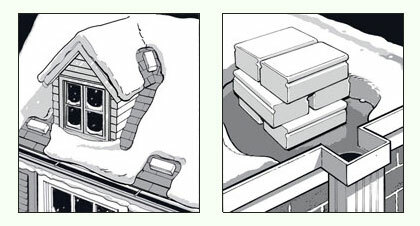 Bricks placed in gutters will aid in water flow but will not prevent ice dams. Replace as needed. White coloring beneath brick is dried brine. It will wash away as soon as brick is removed or dissolved. For very small roofs with minimal drainage, place 1-2 bricks about 1 ft. from drain. Larger roofs require stacked pairs of bricks to effectively deice larger amounts of water. Place about 1 ft. from drain or scupper opening in area where water flows. Replace bricks as needed.